Ward 8, home to Anacostia, was the only ward that saw a decline in the total number of residents in the past decade. And Harrison, who worked with the U.S. Census Bureau in 2000, said that data indicate most black residents who moved out of wards 7 and 8 back then settled in Prince George’s County, as they sought out better schools, safer neighborhoods or bigger houses. “There might be some literal displacement in Anacostia, but the vacancy rates are such that it’s less about some renters get pushed out,” he added. The commercial and residential vacant property rate in Wards 7 and 8 are disproportionately higher than elsewhere. 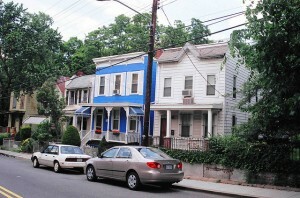 As of May 2011, there were 63 blighted properties in Ward 8 and 52 in Ward 7 [Excel], compared to 22 in Ward 1 and 16 in Ward 4. If Anacostia becomes increasingly attractive to people of higher incomes — black or white — who then buy up properties, housing values could rise. Building owners may increasingly convert modest apartments into luxury units. Proposed development projects in Anacostia may also make living in there more expensive. Such forces are already in full swing in other parts of the city, such as in Columbia Heights and around U Street. For now, it seems this small influx of middle and upper income African Americans into Anacostia isn’t making it too expensive for low-income residents to remain. It could be the groundwork for gentrification and displacement, or it could never happen at all. I have been wondering about gentrification in that part of town since the St. Elizabeth’s West Campus is currently being developed for the Federal Government’s U.S. Department of Homeland Security and many of its offices. With the presence of federal employees commuting and working in that area, I believe change is inevitable. Hopefully, there will be benefit for everyone in some way.